Florence in the late 1520s was a place of turmoil, as powerful families vied for political and economic control of the city. Throughout the unrest, painter Jacopo da Pontormo continued to paint captivating works of art, including the Portrait of Carlo Neroni, the Getty’s Portrait of a Halberdier, and his great masterpiece, the Visitation. In this episode, Getty paintings curator Davide Gasparotto walks through the exhibition Pontormo: Miraculous Encounters exploring the history and significance of the incredible works of art on view. Situating these three paintings together, alongside preparatory drawings by Pontormo and a painting by his contemporary Agnolo Bronzino, provides new insight into Pontormo’s style and technique during this tumultuous period in Florentine life and politics. DAVIDE GASPAROTTO: The Visitation is one of the greatest masterpieces by Pontormo, and is probably also one of the really iconic paintings of early sixteenth century Florence. CUNO: In this episode, I speak with Getty curator Davide Gasparotto about his exhibition Pontormo: Miraculous Encounters. I’m in a gallery at the J. Paul Getty Museum, with Davide Gasparotto, the museum’s senior curator of paintings and chair of curatorial affairs. We’re standing in front of a remarkable painting, painted in 1528 or ’29, depicting four life-size women, two of whom, the Virgin Mary and her cousin, Saint Elizabeth, have just met each other on a city street and are about to embrace. The painting is the centerpiece of an intimate and beautiful exhibition comprising just four paintings painted in Florence, three of them by the eccentric and exquisite painter, Jacopo da Pontormo, and fourth by his contemporary, Agnolo Bronzino; and a few dozen preparatory drawings. It is an intimate exhibition, allowing the visitor the chance to look long and hard at a few extraordinarily beautiful things. Davide, thank you for joining me on this podcast. GASPAROTTO: That you very much, Jim, for having me. CUNO: Now first, tell me about the impulse to mount this exhibition now. GASPAROTTO: I think the impulse was primarily the incredible opportunity to have here on loan The Visitation, this large painting on panel, by Pontormo, which is one of the greatest masterpieces by Pontormo, and is probably also one of the really iconic paintings of early sixteenth century Florence. And the opportunity is really extraordinary, because this painting—which as you can see, is very large—it’s almost six and a half feet tall and five and a quarter wide, and it’s still on its original panel and original thickness—never traveled before outside Italy. Actually, it was only lent a couple of times to exhibitions in Florence. So it traveled just from its location, the small church, the parish Church of Carmignano, which is a little town on the hills west of Florence. So it traveled only just a few miles from Carmignano to Florence, but it never traveled abroad. And the painting really prompted the idea of the entire exhibition. 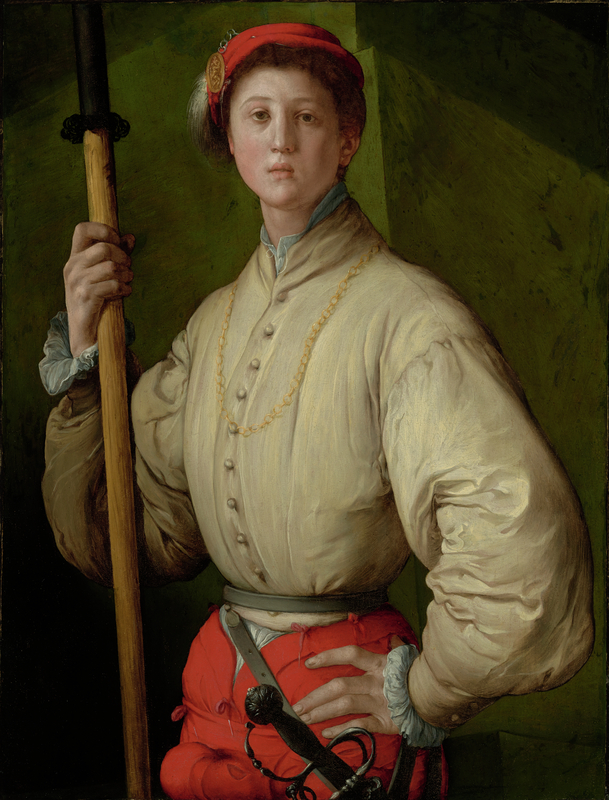 So to put together The Visitation with a few other paintings, among them, obviously, one of the gems of our collection, the Portrait of a Halberdier, also by Pontormo, which were painted almost at the same time. So we created a small, intimate show, which shows Pontormo s artistic development at a precise stage of his career, of his artistic trajectory. CUNO: Yeah. Well, tell us more about the painting itself, beginning with the subject matter, the Visitation. GASPAROTTO: Yes. So as you— as you can see the painting, and as you were saying, the painting represents the Visitation, a very important episode in the life of the Virgin, recounted only in the Gospel of Luke. And it’s the moment when the Virgin, who traveled to the small hill town in Judea, where her cousin Elizabeth was living with her husband Zacharias, it’s the moment when the two women, they meet, they encounter. And it is in this precise moment that they reveal to each other that they are miraculously pregnant. So the virgin Mary’s pregnant with Jesus, and Saint Elizabeth is pregnant with Saint John the Baptist. Elizabeth is miraculously pregnant, because she was old. She was much older than the Virgin, so she was not expected to bear a child anymore. 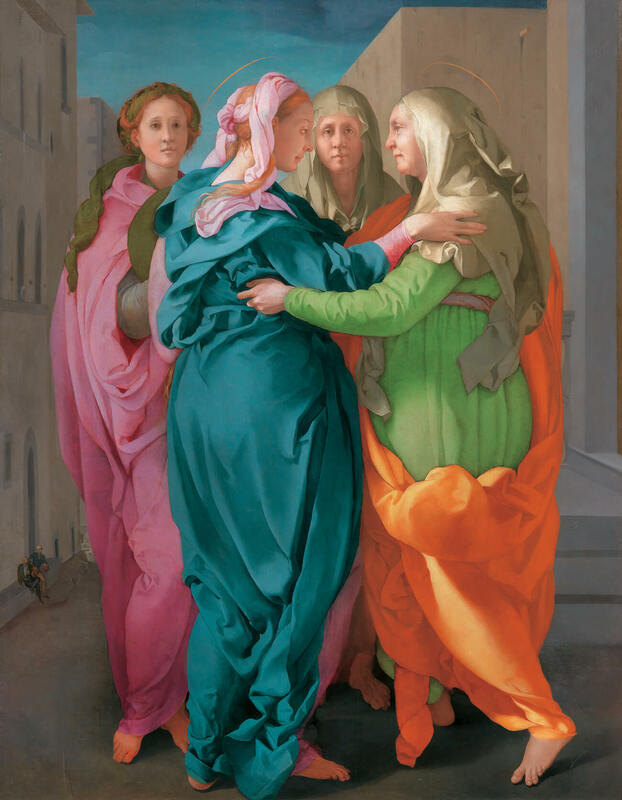 And in Pontormo’s painting, the representation is really pretty unique in the iconography, even comparing with the previous representations of the Visitation. CUNO: ’Cause he’s painted the Visitation before. GASPAROTTO: Because he painted the Visitation before. Like fifteen years before, when he was still sort of an emerging artist, he painted a large fresco with the Visitation in the chiostrino dei Voti of the Basilica of the Santissima Annunziata in Florence. It’s the moment when he was emerging, alongside with his fellow painter, Rosso Fiorentino. He was emerging and he was becoming an independent painter, from the workshop of his teacher, Andrea del Sarto. But the previous representation of the Visitation by Pontormo is completely different. It’s a large scene. It’s dominated by a Classical architecture, very monumental. And it’s a scene populated with many figures. So the meeting, the encounter, happens in front of a large crowd. And Saint Elizabeth is clearly bowing in front of the Virgin, which is, in some way, one of the characters of the traditional iconography of the Visitation. Usually, Saint Elizabeth is shown in an act of reverence, when she’s meeting the Virgin. She’s bowing or even kneeling in front of the Virgin. The previous painting, the previous fresco, the fresco by Pontormo with the Visitation, is clearly inspired by the works of Andrea del Sarto, but also, I think, pays homage to the School of Athens, by Raphael. It’s really a monumental scene. Here, the scene is completely different because Pontormo chose to represent only four figures. They are monumental. They occupy almost the entire space of the panel. And the Virgin Mary and Saint Elizabeth, they are represented as equal. Saint Elizabeth is not kneeling or bowing; she’s standing in front of the Virgin. They are looking to each other. They are represented in profile. And they are accompanied by two other figures. And these two other figures are staring at us. They are frontally representing[sic]. They are looking at us, and in some way, they are really drawing us into the picture. They are really capturing our attention, but they are also attendants. CUNO: So the original chapel, the chapel of which it was originally painted, was— Give us a sense of the context of it. How deep back in space was it from the viewer? How high was it from the floor? Were we looking up at the picture, the way we’re looking at the picture here in the galleries? And what was the context for the commission of the painting? GASPAROTTO: So all your questions are very interesting, and are questions to which art historians try to answer since many years, since when the painting basically was rediscovered in 1904, at the beginning of the twentieth century, in the parish Church of Carmigano. But actually, the current location of the panel is not the original one. And obviously, we, analyzing visually the painting, we can see that it was painted for an altarpiece, so it was originally probably pretty high up. GASPAROTTO: Yes, yes, for sure. And— But we don’t know the original intended location for this panel, because this panel is documented as early as 1677. So more than one century after it was painted, in a villa owned by the Pinadori family in Carmignano. And actually, the painting is mentioned only indirectly, because it’s mentioned in a guide of Florence, in relationship to, actually, it’s preparatory drawing, the modello, which also is exhibited here in the show. And it’s mentioned as being in this villa owned by the Pinadori family near Carmignano. And then it’s only afterward, at the beginning of the eighteenth century, that it was brought to the church. And to an altar, which has a stone frame, a kind of a beautiful stone frame, but from the beginning of the eighteenth century, which is not even of the right size of the painting. So the painting ended up in the parish Church of Carmignano, in some way by chance, because there was this relationship with the Pinadori family. But we think that probably, the painting was executed for a member of the Pinadori family in the sixteenth century. Perhaps Bonacorso[sp?] Pinadori, who was an apothecary, and who is documented in relationship with Pontormo because as an apothecary, he was selling pigments to painters. And he is documented both in relationship with Pontormo, and also with Pontormo’s pupil Bronzino. But we don’t’ know the original location. It was perhaps one of the churches in Florence or one of the churches in the immediate outskirts of Florence. CUNO: Yes, I see— so I understand this. CUNO: The painting, while now in the parish church, was not painted for the parish church. CUNO: …because it’s so important. But it’s a painting of, as we said, quite substantial scale. The figures, as described, are life-size. In the original circumstances of its painting and for its viewing, it would’ve been a dominant picture. CUNO: Whether it was in a private house or in a church. It would have been dominant, no? GASPAROTTO: [over Cuno] Probably. I am convinced that obviously, it was painted for a chapel in a church. So it would have publicly exhibited, in some way. There are some consideration[s] we can do about the fact that, as I was saying, the Virgin and Elizabeth are represented as equal. Because perhaps the original patron wanted to emphasize not only the figure of the Virgin and the importance of this moment in the history of the life of the Virgin, and so in the history of salvation, but also probably the original patron wanted to emphasize the figure of Saint Elizabeth and the fact that she was bearing John the Baptist. And we know that John the Baptist is the patron saint of Florence, so it’s a very important figure for the history and for the history of Florence. CUNO: Describe to us the intimacy and the glance exchanged between the Virgin and Saint Elizabeth. The older Saint Elizabeth is looking at the younger Virgin with a sense of understanding, a sense of shared experience, and then the miracle of the birth of each of the two children. GASPAROTTO: [over Cuno] Absolutely. And also, the light in this painting is coming from the left. So basically, the face of the Virgin is in shadow. And the figure who is really sort of lighted, it’s the figure of Saint Elizabeth. Her face is in full light. And the other amazing, really, aspect of this painting is the location that Pontormo chose to represent the scene. Usually in the iconographic tradition of the representation of this scene, the scene takes place or inside the house or in a sort of an enclosed space, like an interior garden. Here, clearly, Pontormo chose to represent this scene on the street, on the street of a city which is clearly a contemporary Florence. The palace, which is represented on the left, is clearly the typical Florentine palazzo, a three-stories palazzo, with a stone bench on the ground floor. And on the stone bench on the ground floor, we see two male figures that probably are the two husbands of the two women, so are Joseph and Zacharias. They are waiting. CUNO: …where the four women are. GASPAROTTO: Absolutely. Even if I have to say that here, Pontormo really— the emphasis is all on the figures, and not on the monumentality of the figures. I would say even enhanced by these incredibly elaborate draperies. And it’s not on the space. In some way, the space is— Yes, it’s a sort of a backdrop, but there is not really the interest in the representation of perspective in a, you know, sort of a mathematical, rigorous way, as it would have been in a painting of the fifteenth century, because the emphasis is really entirely on the human figures. CUNO: Now, tell us about the colors with which the draperies are painted, around the women. How complimentary they are, but how shockingly bright and theatrical they are, as well. GASPAROTTO: Yeah. Yeah, no, the colors are obviously one of the greatest achievement of this painting. They are really bright. They are strongly contrasting with each other. There are these oranges and green, pink and blue, rose and green. So they are strongly contrasting, they are extremely bright. They owe very much to the colors, I think, of Michelangelo. Pontormo knew, for sure very well, a very painting on panel by Michelangelo, the famous Doni Tondo, today in the Uffizi, which is— was executed in 1504. So like twenty-five years before this painting. And probably, even if we don’t have documents about Pontormo being in Rome, Pontormo was, at some point, in Rome and looked at the vault of the Sistine Chapel, with the bright colors that we know now, that were revealed by the recent cleaning, like fifteen years ago. So these bright colors, they owe very much to Michelangelo. And we know that Michelangelo admired a lot Pontormo. And even there was, later on, in the 1530s, there was— there was also a working relationship between the two. Michelangelo provided cartoons, that then Pontormo transformed, painted, transformed into real paintings. CUNO: Now, on a wall to the left of this painting is the drawing that you made reference to, a preliminary drawing for the painting, which is called a modello because it’s in such detail. It both characterizes the figures, but it places in rather precise location, where they would find themselves in the painting itself. 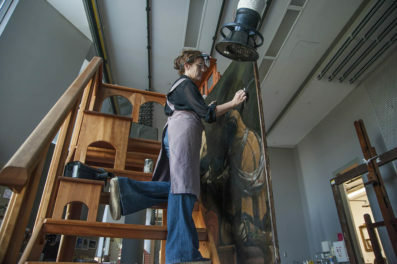 And then it’s marked off, squared off, so that it could be transferred, as it were, enlarged from this scale to the large scale of the painting. It’s the only drawing that we have related to the painting, is that right? GASPAROTTO: Yes. It’s the only surviving drawing. We should imagine that there were, for sure, other drawings for this painting. Of details, probably, of the single figures or— But this is really the modello. And it actually, we really believe that it is the modello mentioned by Giovanni Cinelli in 1677, when he saw it in the house of Senator Andrea Pitti in Florence. And it is in this instance, which I was mentioning before, that Cinelli says, “This is a beautiful modello by Pontormo, and I believe this is preparatory, this is the final modello, final sketch for a painting which is in the villa owned by the Pinadori in Carmignano.” And we are almost sure that Cinelli was right in saying that this is the modello, so the final, because it’s very finished. It’s very detailed. It follows very closely the final composition, if, even if there are still some areas of uncertainty. Some pentimenti, as we say in Italian. So some areas where Pontormo is not even sure of the final, you know, resolution of certain details. Like for example, in the area of the feet, there are several uncertainties. But the important thing you were mentioning is that the painting is squared. So there is a sort of a grid superimposed on it, realized in red chalk. And the grid allowed Pontormo to sort of transfer the drawing to the gesso ground of the panel, when he was executing. And obviously, this was one of the important discoveries of the recent cleaning of The Visitation, of the panel. Four years ago, the panel was cleaned in Florence, and infrared reflectography revealed that underneath the paint layers of the painting, there is the same grid which is in the drawing. So Pontormo basically enlarged the grid seven and a half times, in the process of transferring. And then he painted, obviously, freehand, with charcoal on the gesso ground. And this is very, I will say, not unusual; but it’s a departure from what we would think would have been the classic technique. So which would have been the use of a cartoon, of a full-size cartoon to transfer the drawing into such a large panel. While in this instance, he used this method, we don’t know why. Perhaps because there was a lack of supply of big pieces of paper, because of the historic circumstances of this specific moment in the history of Florence. CUNO: Now, we keep dancing around the political turmoil at the time of the painting, that Florence was suffering at the time. Tell us about that and what the nature of the turmoil was. GASPAROTTO: So the nature of the turmoil was that in 1527, as a consequence of the disastrous sack of Rome, when mercenary troops and Spanish troops occupied Rome. The pope, who at the time was a Medici, came from the powerful Florentine Medici family, Clement VII, as a consequence of this, the Florentines expelled the Medici from Florence. And the Medici, at the time, they were not the official ruling family; they were just the most influential family in the city. They expelled the Medici and they proclaimed a republic, the so-called last Florentine republic. CUNO: How destructive was the siege? Or how violent was it? GASPAROTTO: It was very disruptive, especially because all the way of supply or the city were blocked. So many people, more than 30,000 people died of starvation. The Florentines were obliged to raze many of the buildings, convents and churches, which were in the outskirts of Florence, outside the walls. It was a dramatic moment. Many people left the city. Obviously, many people loyal to the Medici, they left. Among them, also artists, like for example, Giorgio Vasari or Baccio Bandinelli, who were artists very close to the Medici. Pontormo stayed. We don’t know anything about Pontormo’s political sympathies, so we have not to assume that he was a fierce republican. Because he worked for the Medici before the siege, and also he worked for the Medici after the siege. But he stayed, we think, mainly because he had just bought a house in Florence, and it was a big investment for him. And so he wanted to stay, to protect the investment. And so staying there, he sought commissions from people who stayed. CUNO: How was that possible, given the siege itself and given the enclosure around the city of Florence? How was it that he could get commissions, and people were still commissioning pictures? He could still find the materials to paint with? GASPAROTTO: Yeah. Maybe it was more difficult for certain supplies of paper; but I think there were supply of panel. And also, there were people who wanted, despite the danger, to commission religious picture for their chapels, or even their private homes. And especially he had commission to paint portraits of people who were profoundly engaged with the defense of the republic, who were really engaged in defending the city. CUNO: Like the great Getty portrait over here. Let’s walk over and see this portrait, this painting. ’Cause this is precisely what you’re talking about. It’s a portrait of a young man called a halberdier. He’s holding a halberd, which is pole-like instrument of defense or attack, a weapon. Tell us about this and what we know of the circumstances of its commission or its painting. 00:25:37:05 CUNO: Because we don’t know the date of the painting. CUNO: …it was about the same time. GASPAROTTO: We date it on stylistic ground, in association with The Visitation. Obviously, the painting is not, as many Renaissance paintings, it’s not signed. It’s not dated. Definitely represents a young man, very elegantly dressed. You know, he wears a very elegant silk satin sort of yellow jacket, the red pants, a nice smart red cape. And we have to remember that this sort of whitish and red are also the colors of the coat of arms of Florence. He bears a polearm, which is sometimes called as an halberd. He has a sword. And he’s standing in front of one of the city bastions. Which is depicted in a sort of a abstract way, a little bit like the— one of the buildings in the background of The Visitation. The pose, with the left hand on his hip. It’s the same pose of two famous statues of the Florentine tradition, the statures of David by Donatello and Verrocchio, which were symbols of the city. Because the Biblical hero David was one of the symbols of Florence. And he’s clearly in the pose of these statues. And then also, the medal he wears on the cap, the little golden plaquette he wears on the cap, as the representation of the struggle of Hercules and Antaeus. So the Greek hero Hercules overcoming the giant Antaeus. And also Hercules was one of the symbols of Florence, since the Middle Age, Hercules is represented in the seal of Florence. So there are a lot of allusions to Florence. CUNO: Which would put the commissioner of the painting, on the side of Florence against the emperor in Rome. GASPAROTTO: In the emperor and the pope, who was a Medici. So if we believe that this was painted in the end of the 1520s, it should be a portrait of a young man engaged in the defense of Florence, in front of— standing the night watch in front of the city bastions. And so it is this sort of belief, with this belief, that we are able to associate our portrait with a portrait mentioned by Giorgio Vasari in his Life of Pontormo. CUNO: Contemporary with the Life of Pontormo. CUNO: So the mid-sixteenth century text. GASPAROTTO: Vasari published the Life of Pontormo in 1568, in the second edition of his famous book, eleven years after Pontormo died. And obviously, it’s a well-informed biography. Many of the informations was provided to Vasari by Pontormo’s pupil Bronzino, who was a court in Florence, along with Vasari, at the Medici court. And he— Vasari tells us that during the Siege of Florence, Pontormo painted a beautiful portrait of Francesco Guardi, dressed as a soldier. CUNO: Do we know anything about Francesco Guardi? GASPAROTTO: And we know something about Francesco Guardi. We know that he was born in 1514, so he would have been like fifteen to sixteen years old, which is— perfectly fits the appearance of the sitter in this portrait. And he was from a wealthy family, a family who had a property just outside one of the doors of Florence, the Porta San Miniato, a property which was called La Piazzola. And we believe that here, Francesco is representing as a young, proud defender of the city, standing on his own property outside the walls, defending the property. CUNO: But now, you suggested that’s a proposed attribution or a proposed identification of the subject of the painting, linking it to the text by Vasari. But there’s an alternative view of that, right? CUNO: And it came into play when we acquired the painting in 1989. GASPAROTTO: Yes, exactly. So when we acquired the painting, it was acquired as a portrait of the young second Duke of Florence, Cosimo I, de Medici. This would imply that the painting would have been painted in 1537. Much later than we believe. So when Cosimo became duke and when he had just defeated the last resistance of the old republican, in the Battle of Montemurlo [inaudible] Siena[?]. There is a reason for this. Because when this painting, at the beginning of the seventeenth century, was owned by the Riccardi family in Florence. And there is an inventory of 1612, where this painting is mentioned and clearly described. And it’s described as the portrait of Cosimo de Medici. But I always say we don’t have to take old inventories as gospel, because often in old inventories, the identification of the sitters are made up. They are not right. And in fact, in the Riccardi inventories, there are a lot of portraits which are identified as portraits of Cosimo de Medici. Obviously, the Riccardi, they bought the Medici palace. They had a strong association with the ducal family at the time, the grand ducal family, the Medici, and so they wanted, in some way, to show that in their collection, there were portraits of the second Duke of Florence, the great Cosimo I de Medici. So I don’t think this is enough strong proof to prove that this is a portrait of Cosimo de Medici. And I’m convinced that since on stylistic ground, our halberdier is datable to the late 1520s, it’s much more probable that this is the portrait of Francesco Guardi mentioned by Vasari. Also, Cosimo would have never shown him just in the beginning of his reign, dressed in this way. We know that he always dressed black and he was very austere, and he would have never been— wanted to be representing in such a showy attire. CUNO: Yeah, yeah. Well, it’s very convincing to see this picture in comparison to the great The Visitation, because of the similarity in the portrayal of the two women in The Visitation who are in the background, the servants, who are staring out at us or looking at us, in ways not dissimilar to the way that this young man is looking at us. There’s a real sense of similarity between the paintings that’s convincing, at least to me, that this painting would have to be of the earlier period, the period of 1527, 1528. CUNO: The sense of vulnerability, too. GASPAROTTO: Yes. There is a sense of— He is apprehensive, in some way. Yes, he’s staring at us. But there is a sense of vulnerability. And there is a very strong sort of freedom of the brushwork. For example, the beautiful sleeve. I think Pontormo, at this moment, was also aware of some developments in Venetian portraiture, probably through portraits of Sebastiano del Piombo, the great Venetian artist who was working in Rome, and that painted portraits that Pontormo could have seen. CUNO: Yeah. Now, next to it, to the right of it, of the halberdier, is another portrait. This time, another rare opportunity to see this picture, which is normally in London. Tell us about this painting and how it relates to the two paintings we’ve described so far. GASPAROTTO: I think the exhibition really represents a great opportunity to see these two works together. Actually, when Bruce Edelstein, who is the cocurator of the exhibition, and myself started to work on this project, the idea was, yes, this would be a great opportunity to see together The Visitation and the Halberdier, to finally sort of prove that they were painted at the same time. But also, I had that idea that it would have been incredibly interesting to see these two portraits together. They clearly relate to each other. The two men, they’re almost the same age. Maybe this man is a little bit older than Francesco Guardi. They have very similar attire. The both wear a sort of a satin silk jacket. CUNO: athey’re of different colors, however. CUNO: [inaudible] black color that you were talking about. GASPAROTTO: Yes, yes. This is— Yes, this is all dressed in black. And maybe this had something to do with its name, the name of the sitter, possibility Carlo Neroni, another portrait mentioned by Vasari as executed by Pontormo, during the Siege of Florence. And you know, Nero, in Italian, means black. So there may be there is an allusion to the name of the sitter. But the— despite the difference of the color, the attire is very close. He has a very beautiful sort of leather jerkin over the satin jacket. He is armed, too; he has a sword. He does not bear a polearm, but he bears in hand a— He’s maybe retrieving or showing a letter. There are some letters that we can read in the letter, but we are not able to interpret in a sort of a complete way. CUNO: Would that mean something? Was that a device that the painter would have used, that would help us understand something about the context of the painting, even if we can’t read the letters in the letter? GASPAROTTO: Yeah, perhaps, perhaps, because since the first word that we can read is domini, so it’s relating word that means to the Lord. Maybe there was the name of the sitter there. And he’s the only portrait by Pontormo where the man wears a ring. We know that Carlo Neroni married Caterina Capponi in 1529. So perhaps the portrait is also related to his first wedding. But like the halberdier, he wears the smart red cap. And he has his hear cut short, exactly like the halberdier. And we know from contemporary diarists, that at the time of the siege, young Florentines started to wear smart caps and to cut their hair short, instead of having the hair long, to the shoulders, like it was before. So the fashion is really the fashion of the time of the siege. CUNO: Now, there’s a third painting on this wall, the fourth painting and last painting in the exhibition. It’s not by Pontormo, it’s by his pupil, Bronzino. But yet it bears a relationship to Pontormo. GASPAROTTO: Yes. There’s a lot of relationship to Pontormo. 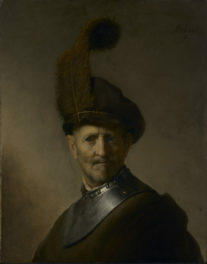 So if we believe that our halberdier is the portrait of Francesco Guardi, Vasari provided us with an extra information, because Vasari, in his Life of Pontormo, says that Bronzino, that at the time was working with Pontormo, was in the workshop of Pontormo, was still young, executed the cover for the portrait of Francesco Guardi. CUNO: Would it have been hinged to the painting, so you could just lift it off? GASPAROTTO: [over Cuno] Could have been. Could have been hinged, or alternatively, could have been a frame and there could have been a sort of a sliding mechanism, which allowed to slide the— one painting on top of the other. CUNO: Was this a popular subject at the time? CUNO: Would there have been a particular meaning to [inaudible]? GASPAROTTO: I think there is a meaning. Actually, I would say there is layers of meaning in this painting. 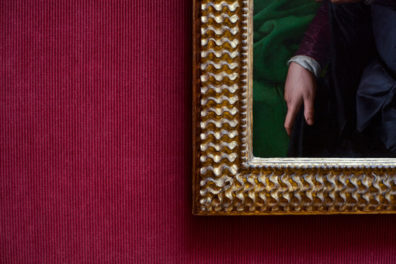 Obviously, Bronzino was a very cultivated artist. We know that he was also a poet. He was even more cultivated than his teacher, Pontormo. He was a lover of Dante, all the Florentine poetry; he was a poet himself. So he could have even conceived this allegory. And obviously, this allegory refers to the power of art to give life to a certain subject. So there is clearly a meaning, which can be associated with a big debate that was happening in Florence at the time, the debate on paragones[sp?] or on the comparison between painting and sculpture. Is sculpture more powerful than painting, or is painting more powerful than sculpture? It was a big debate among artists at the time. But there is, I think, also an extra layer to this painting, which can relate it to the Siege of Florence, the dramatic circumstances of the Siege of Florence. Because in the altarpiece, which is representing in the middle, there is an inscription, “Heu, Vincit Venus,” so at the end, Venus wins. And the relief represented in the altarpiece, there is the figure of Venus semi-naked with an apple, with Mars, the god of war. And so it’s a clear allusion that Venus, the goddess of beauty and love, only can win over war. So perhaps that is an extra layer, and there is an allusion to the dramatic circumstances of siege, which involved, obviously, the figure of Francesco Guardi. CUNO: Yeah. Now, let’s back to The Visitation, with which we started. It was recently cleaned and restored by Daniele Rossi, who previously restored three other paintings by Pontormo, and knows the artist and his technique quite well. What did he learn about the painting of The Visitation by restoring it? GASPAROTTO: I think the most important sort of result of the cleaning was that we learned that really, seen with the infrared reflectography, the grid underneath the painting, it was the definitive proof that the modello in the Uffizi was the preparatory drawing, and that the painting was executed without the use of a life-size cartoon, but just, you know, enlarging the grid. In terms of the technique, I would say there is really nothing unexpected, nothing extraordinary. There is obviously the great skill of Pontormo. Obviously, the appearance of the color is great. But the pigments that he used, there is nothing extraordinary. There is something I would like to tell you, is that here, we have something in connection with the famous Entombment or Deposition from Santa Felicita, which is probably the most famous painting by Pontormo. We have the beautiful drawing, which is a self-portrait by Pontormo. 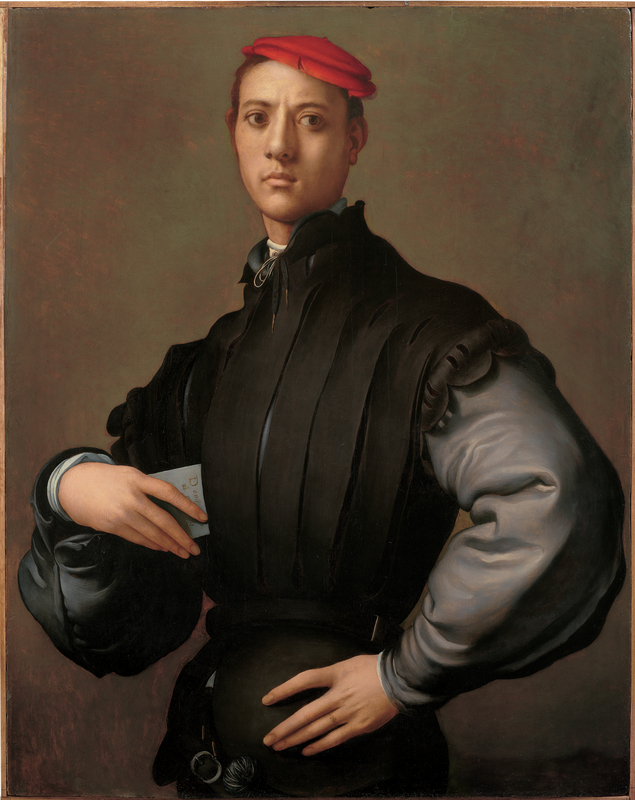 GASPAROTTO: It’s a wonderful of the sort of young Pontormo—he was like thirty years old. And it is a self-portrait that then he used as one of the figures in the background of the Entombment. Probably in the final painting, it represents or Nicodemus or Joseph of Arimathia, but it’s clearly a self-portrait of Pontormo. CUNO: [over Gasparotto] And why would he have done that? Because he wanted to associate himself with the commission or with the theme of the painting itself? GASPAROTTO: I think probably he wanted to associate himself with the commission. But also, he represents himself as a sort of witness of this scene. So it was something to stress his presence, I think, as an artist in the composition. CUNO: Now, Davide, I have to confess that I studied Italian Renaissance painting almost forty years ago, at the feet of a man named Sydney Freedberg, who wrote a book about Florentine painting, Italian painting at this time, and which this painting was on the cover. He was a specialist in what was called Mannerism or la Bella Maniera, a style of painting or sculpture that emphasized the aesthetics of refinement and elevated emotion over the drama of narrative and the persuasive depiction of the muscular human body, as in the work of, let’s say, Leonardo, Raphael, or Michelangelo. Tell us about la Maniera. How do we see it in this painting? That is, see it in The Visitation? And whether it’s still a term which one uses. ’Cause I see it was avoided in their[?] texts. GASPAROTTO: So it’s interesting what you say, because the term Maniera obviously is extensively used in the sixteenth century, and is used especially by Vasari in his influential Lives, and sometimes associated with Bella Maniera. The Bella Maniera, for Vasari, is the style of its own time, when according to him, painting and all the arts reach a sort of a peak of perfection. So Maniera, Bella Maniera, is something was associate with the sixteenth century. The term, the other term that you used, Mannerism, is a sort of a twentieth century creation. I think we try to avoid as much as possible the use of sort of modern critical categories. And it was sort of used when this moment of the evolution of Italian art from about 1520—which is sort of a threshold because it’s the death of Raphael—until the end of the century, when the new Baroque language with Caravaggio and Caravacci[sp?] emerged. It’s this moment that was called the Mannerism. And it’s a moment when the lesson of the great masters of the early sixteenth century, like Michelangelo, Raphael, was exploited by the artists, but was taken to a sort of a new level of refinement. It’s an artistic language where complexity, virtuosity, but also tension, instability, distortion of human proportion, a particular kind of sophistication. A sort of also a flattening of the pictorial space, like we see in Pontormo’s Visitation. So a very sophisticated language emerged and dominated in Italian art. And I think in some way, when Mannerism was coined to stress that this language, this sophisticated, complex, intellectual-in-some-way language was linked to a moment of political, moral crisis in Italy. It marks the end of the sort of classic Renaissance, and it goes in a period where, you know, there is tension, there is the Reform. The Reformation is going on, so the Church is in crisis. And so this particular language was read by art historians, by critics at the beginning of the twentieth century, as a symptom of crisis, with a clear sort of parallelism with what was happening in the arts, in contemporary art. So it was seen as a break, as a moment of real crisis, of change. And alternatively, we can think to this language as a sort of a development of what the great masters—Raphael and Michelangelo especially—did at the beginning of the century. And it was a sort of a development of their ideas in a sort of an extreme way. And these are sort of, today, two contrasting views of Mannerism or Maniera. And for sure, Pontormo was one of the greatest protagonist of this moment. He’s working on the great achievements, especially of Michelangelo, of his teacher, Andrea del Sarto. But he’s also going beyond, is doing something different, something new. CUNO: Yeah. The painting is extraordinarily beautiful; the exhibition is very poignant and moving. And we’re grateful to you for the exhibition and for spending time with us this morning on the podcast. So thank you, Davide. GASPAROTTO: Thank you very much, Jim. It was a pleasure to spend some time with you in the gallery today.